According to the findings of an alcohol consumption statistics study reported in Addiction, only 43 percent of all those who go through an alcohol addiction treatment program are able to abstain from drinking in the short term. This number is even less for those who do not undergo a formal treatment process—a paltry 21 percent. These numbers prove that relapses among treated and untreated alcohol addicts are very common. Does this mean that going through the treatment process is an exercise in futility? Does this mean that if you are an alcoholic, you are likely to remain one for the rest of your life? You can win the battle against alcohol, prevent a relapse, and remain sober for life if you do not give in to the triggers. Alcohol use triggers are events, people, places, social interactions, situations, and emotions that make a recovering addict feel the need for and then actually reach out for a drink. Yielding to triggers is the first step that for many people marks the start of the road to relapse. Drinking triggers can range from cues in the external environment—like being around alcohol or seeing other people drink—to negative emotions that feel overwhelming. Chronic alcohol abuse tweaks the brain’s risk-reward circuitry, so it is able to override the cognitive faculties of the person. The recovering addict’s brain “believes” that drinking is the most effective or rewarding way to deal with problems. He or she responds to problems by drinking. The coping mechanisms of a recovering addict are severely compromised. He or she doesn’t know any coping strategy other than drinking. Additionally, being in recovery and having to deal with the distress of physical and mental withdrawal symptoms stretch his or her coping mechanisms to the limit, which makes it much harder to reverse alcohol tolerance. Because the recovering addict’s brain perceives and responds to environmental stimuli differently, what is merely a bother to others is a powerful drinking trigger for him or her. You have to gather the facts. You need a plan. You have to execute it thoroughly. You have to “learn” how not to yield to drinking triggers. Triggers are that powerful. Triggers are everywhere around you, and they usually don’t go around looking like something to stay away from. 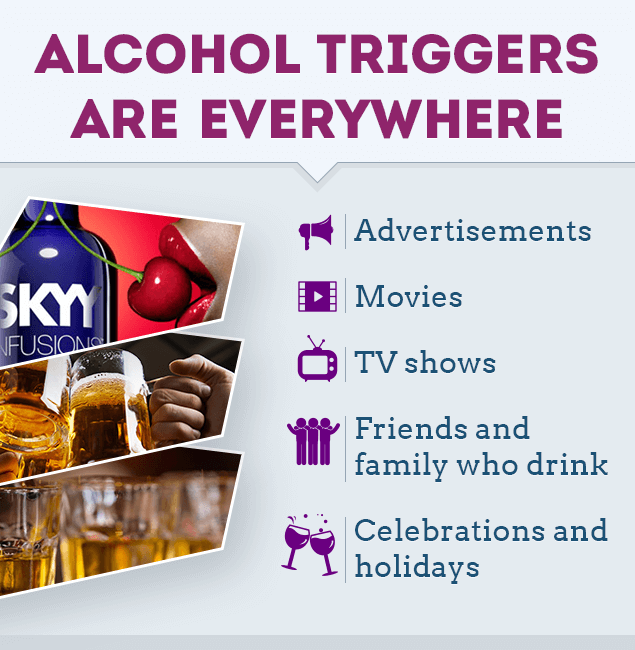 Nor are all drinking triggers seemingly related to alcohol. Learn about the common triggers, so you know when you meet one. These are cues like seeing people drink or having alcohol near you. Even watching alcohol commercials on TV can trigger urges. Negative Emotions: Emotions like fear, anger, anxiety, guilt, shame, hopelessness, or depression are powerful stressors that tend to overwhelm coping mechanisms. Now the alcoholic in recovery is a person who once used to deal with stress by drinking. He or she has to now relearn healthy coping mechanisms to manage emotional stress. The cognitive center of the brain has to be retrained, so it can analyze and deal with the stressor objectively, without resorting to alcohol, which “feels good” but doesn’t resolve the issue. Physical Stress: Physical stress can be a chronic illness, a painful condition, or unpleasant withdrawal symptoms that naturally dampen your mood and may make you want to drown it all in a drink. Ensure that you eat a nutritious diet that will help you heal faster. It is also a good idea not to rush headlong into a rigorous gym or workout routine just when you have started recovering. Lack of Sleep: Lack of sleep prolongs any physical healing process that you might be undergoing and can also be a cause for bodily stress. Additionally, being sleep-deprived impairs your ability to recognize triggers and focus on staying away from alcohol. Drastic or Profound Life Changes: Profound life changes can leave us feeling overwhelmed. This does not refer only to somber events like loss or separation but also to happy events like marriage, having a baby, or being promoted at work. If you feel that you are incapable of handling the sudden change, you might want to have a drink to steady your nerves. Needless to say, the best way not to yield to triggers is to stay away from them. Ask your friends and family members not to drink in front of you. 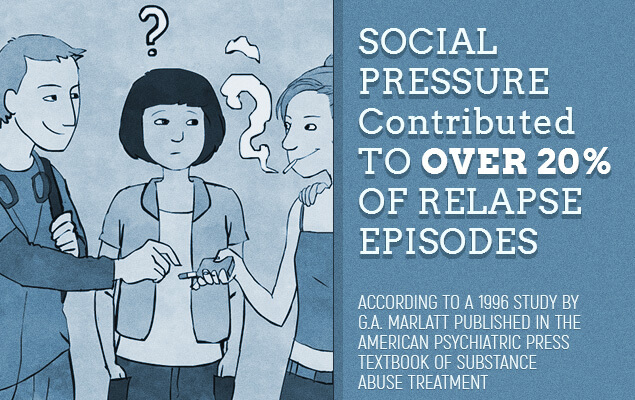 Alcohol and college students have a strong link, so it is advised to have an extra conversation with friends and family studying in high school and colleges. If there are people in your house who drink, request them to stock their supplies where you are not likely to come across them. Avoid meeting up with your old drinking buddies. Also, request them not to visit you. Find new routes to commute to your workplace or school if the earlier one goes past bars or pubs. Avoid going to social events where drinks will be served. Politely explain your reason for declining the invitation to avoid being misunderstood. Examine relationships that might be stressing you mentally. Talk with the other person to work out solutions to the problems that trigger arguments, misunderstandings, and accusations. Else consider walking out. Examine your job and living arrangements to find out if there are emotional and/or physical stressors in them. Inconsiderate boss. Mean co-workers. Long hours that leave you physically drained. Flatmates who push your buttons. A bar next door. A neighbor who is an alcoholic. You could be living with a trigger or walk into one every day. Relapse treatment measures fall into two categories: medication therapy and psychotherapy. • Contingency Management: This therapy works by receiving rewards like vouchers and movie tickets for staying away from alcohol. There are medicines prescribed as a part of treatment program for alcohol addicts. Disulfiram, Naltrexone, and Acamprosate are the most known medicines used during the treatment. They work by lessening alcohol cravings and by producing unpleasant side effects when the person starts drinking again. Disulfiram (Antabuse) is prescribed to reduce initial drug use in addicts who have entered into treatment. This drug produces unpleasant effects like nausea when drinking alcohol. Eventually, the person learns to associate alcohol with these effects and reduces or stops drinking. Naltrexone (ReVia, Vivitrol) can manage alcohol cravings. Acamprosate (Campral) reduces the appearance and/or severity of alcohol withdrawal symptoms. This, in turn, lessens the urge to drink. Psychotherapy helps you identify triggers or anticipate them, so you can be on your guard. During psychotherapy, you also learn behavioral responses that help you deal with triggers healthily and not give in to them. Cognitive Behavioral Therapy (CBT): During these sessions, a person is taught to be mindful of his or her emotions or what’s going on in the environment, so he or she can identify or anticipate triggers. The individual is also taught coping strategies to deal with triggers when they face one, like distracting the mind by reading, going out to walk, listening to music, meditating, or watching a movie. Repeated cue exposure modifies behavioral responses in people who were once used to deal with triggers by drinking. Contingency Management: This is a nifty trick! People receive rewards for staying away from alcohol. The rewards can be vouchers they can redeem at a retail store or tickets to a movie or a concert. This relapse prevention technique strives to rewire the brain by making it “learn” that positive behavior is more rewarding than alcohol-seeking actions. Relapses are frightening, disappointing, and frustrating. The triggers seem to come out of nowhere and catch you unaware. Worse, it is quite hard to fathom how seemingly innocuous people, places, and events can be triggers. It is no wonder myths surround the issue of alcohol relapse and triggers. Myths breed confusion, anxiety, and fear, which, in turn, lessen your belief in the treatment process or chip away at your confidence. Know what is real and what is not to improve the chances of sobriety. Myth 1: Being treated for alcoholism guarantees lifelong recovery. First, you have to understand that the rates of alcohol relapse are similar to what they are for other chronic physiological disorders like diabetes, asthma, and hypertension. You have to continue taking your medications for these disorders and maintain a certain lifestyle. Likewise, sobriety is a lifelong journey. It is not a destination where, after you reach, you can put your feet up, relax, and take it easy. A stint at a rehabilitation center for alcoholics prepares you physically and psychologically for the journey. Myth 2: Relapse is inevitable after abstinence because the triggers are everywhere. No, unless you give in to the triggers­. Remember those 43 percent of the people who did not relapse? They have the greatest chance of remaining sober for life. The trick to stretching the abstinence period is to learn to dodge the triggers or fight them when you have no choice but to live with these. You have to tweak your attitudes and beliefs, learn new coping mechanisms, alter self-sabotaging behavioral responses, beat stress, and overcome negativity. This is how you can arm yourself to fight and beat the relapse triggers. Myth 3: It takes only a moment of weakness to relapse. This is one of the most damaging myths that make people let down their guards and set themselves up for a relapse. The moment when you break the protective barrier that you had so carefully constructed around yourself to reach for a drink and gulp it down, is built over time. It is a chain reaction. Something upsets you and instead of remaining calm and objective, you react impulsively and let the problem get out of control. Then you feel guilty or embarrassed. Or you feel irritated at the people around you for “making” you react the way you did. So you isolate yourself from these people, places, and situations. As you get lonelier, you start to harbor thoughts of alcohol. Maybe you start to associate yourself with your drinking buddies and romanticize your drinking days and how alcohol made you feel. And it isn’t long before you slip back into your old drinking habits. One slip does not lead to a relapse. There are warning signs. The alarm bells start ringing long before. If you are mindful, you can recognize these signs and put the brakes on your behavior and tame your thoughts. This stops the chain reaction. Myth 4: Relapse is a sign of weak will. On the contrary, relapse is another tell-tale evidence of how chronic alcohol abuse tweaks the brain and changes the reward circuitry. These changes take place over time; you cannot expect the brain to snap back to normalcy instantly. There is much work to be done even after the physical effects of alcohol wear off. The brain has to be retrained. Attitudes and belief systems have to be modified. Behavioral responses have to be relearned. Till then, the chance of a relapse remains high. You cannot intimidate or shame a loved one to stay clean. Nor can the person will himself or herself to abstain from alcohol. Myth 5: You are alone in this journey. No. In fact, your chances of success decrease drastically if you intend to make the journey alone. You need the support of your family and friends. They should not expose you to triggers like drinking in your presence, taking you to pubs and bars, or stressing you out emotionally. You need the support of therapists and counselors. They will teach you behaviors and help you unlearn old and self-destructive ways of thinking and functioning. According to scientists and doctors, alcoholism is a chronic relapsing disorder. Many recovering addicts relapse, but they also bounce back stronger with the knowledge of how the drinking triggers work on their brains and how they can fight the urges the next time. Believing that triggers can be overcome is the key to preventing alcoholism relapse. Know your enemies. Stick to the relapse prevention plan. But most importantly, seek help from those who know the disease and the substance.